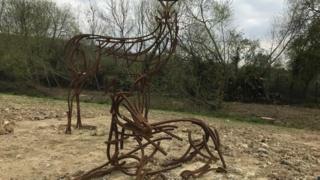 Art sculptures in the grounds of a new crematorium have been funded by recycling metal body parts left behind after cremations. The wildlife sculptures at Cheltenham Cemetery and Crematorium were created by artist Andrew Kay. The pieces, which cost £10,000, were commissioned by Cheltenham Borough Council and include deer, a seated fawn, pheasants, and a heron. The new crematorium was built for £8.5m and opened last month. Registrar Ben Jenkins said: "As with many crematoria, we recycle metal replacement joints, pins and implants left from when someone is cremated. Mr Kay said it was the first time he had been commissioned by a crematorium. "Usually my work can be seen in private homes, luxury hotels and housing developments. "However it's great to see how well the pieces work as part of the crematorium layout." The council's Chris Coleman added: "These beautiful sculptures, together with wild flowers and shrubs really do enhance the tranquil spaces surrounding the buildings and grounds."